I used to buy samosas from a lunch truck on my college campus and they were always topped with a sweet and spicy sauce that I just couldn’t get enough of. The language barrier prevented me from ever getting the recipe. But that didn’t stop me from creating my own. Though these low sodium samosas taste great plain, it’s the sauce that really takes them to the next level. So NO SKIMPING! Measure all ingredients for the mango sauce into a large saucepan. Place over medium heat, bring to a boil and simmer, stirring frequently, 15 minutes. Remove from heat and puree smoothly using an immersion blender, standard blender or food processor. Set aside. Place the diced potato into a pot and add enough water to cover. Bring to a boil over high heat and cook for about 20 minutes, until tender. Remove from heat and drain. Mash potatoes in pot, then transfer to a mixing bowl and set aside. Melt the butter for the filling in the (now empty) pot used for the potatoes over medium-high heat. Add the onion, garlic and ginger and cook, stirring, 4 minutes. Add spices and cook, stirring, another minute. Remove from heat and add the mashed potato and yogurt to the pot. Stir well to combine, then gently fold in the peas and cilantro. Set aside. Measure the flour or maida into a large mixing bowl. Add the chili powder and whisk to combine. Add the yogurt and toss to combine. Cut the butter into the mixture using your (freshly washed) fingertips and continue processing until you have a soft dry crumb. Add the water one tablespoon at a time, gathering the dough with your hands with each addition. Once the dough comes together, turn out onto a lightly floured surface and knead for about 8 minutes, until dough is smooth and elastic. Cut the dough into 8 equal parts. Roll each piece of dough into a ball, then use a rolling pin to flatten into a (roughly) 7-inch circle. Cut the circle in half. Take one half and fold the cut (straight) edge over on itself, then pinch the flat seam together. Gently pick up the dough and orient it so that the pinched seam is along a side, the opening at the top. Hold the open cone in your hand. Measure about 1/4 – 1/3 c. of the samosa filling into the cone, then firmly pinch the open top edges together to enclose the filling. The samosa is now formed and should look like a soft triangular pyramid. Repeat process with remaining dough and filling to form a total of 16 samosas. Heat oil in a large skillet over medium heat or (better yet) a deep fryer to 375 degrees. 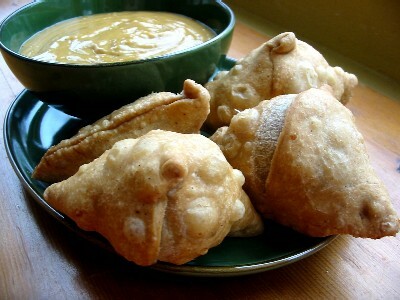 Place samosas into the oil, about 3 at a time, and cook until golden brown on all sides. Remove from oil and drain on towels. Serve warm or cold with the mango dipping sauce.